Since it's hubby and my first Christmas together, I've been scrambling to get together all the Christmas essentials, without spending a fortune! 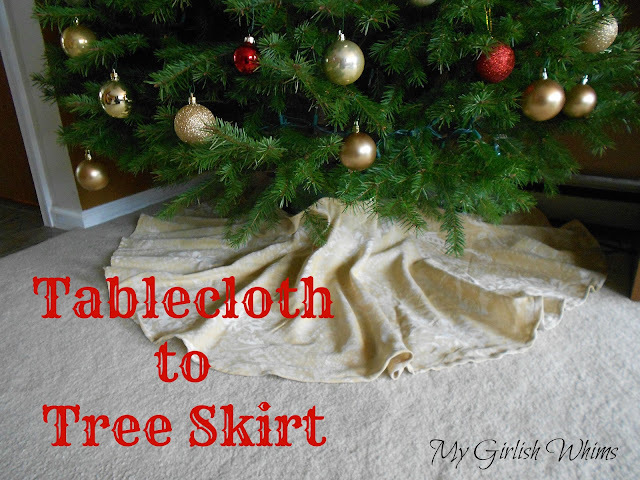 One of the things needed was a skirt for our Christmas tree! I looked at a few in the stores, but they were all so ugly and surprisingly expensive, so I thought I'd give DIY a go. 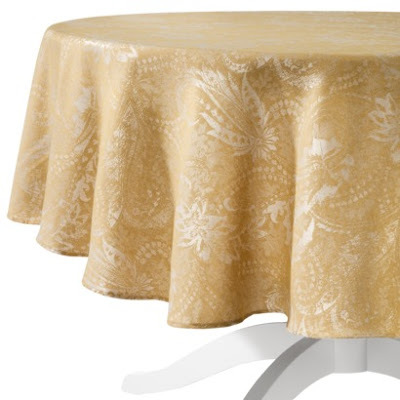 I found this pretty round tablecloth at Target for $12 and thought it would be perfect for under my tree since I have a gold theme going on this year. And since I have a small house and consequently a small tree, I needed the skirt to be small too! The table cloth I had was 70 inches. 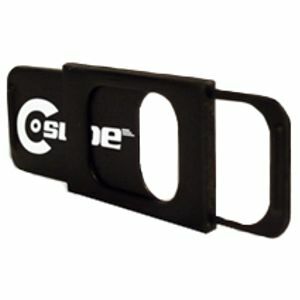 I probably cut around 6 inches from the whole circumference. Then all that was left was to hem all the raw edges I had just cut. Helpful note: avoid cutting off excess fabric from the circumference if possible. It took forever to fold, iron, and sew around the whole thing!! If you have a larger tree than ours (like 6 feet) you could probably get away with leaving your tablecloth outer-edge as is. Here it is all sewed back up under our tree! Since my tree is in a corner, I just tucked the ends together. If the back of your skirt would be more visible, you could easily sew up some ties for it. Perfect! The perfect little skirt for our perfect little first Christmas tree! Beautiful! Great makeover...I made one from a vintage tablecloth and it turned out cute too! Yours is perfect color choice! What a fantastic idea!! It looks easy enough for me to be able to do a different one every year! What a wonderful idea! I might just have to borrow it! Your tree skirt looks very posh!